I have already written a number of books on prayer, and when I finished the last one I believed that was it. I thought I had said all I could about prayer. But when I changed my language to spiritual practice I realized I had a whole new audience�people whose image of God had changed, so their old ideas about prayer no longer felt right; people who did not believe in God, so prayer made no sense; and those who are “spiritual but not religious,” who thought prayer belonged to religion. I have discovered that no matter what the belief or non-belief, there is a longing among many for a way to connect and to become part of “something more,” whatever they name it. 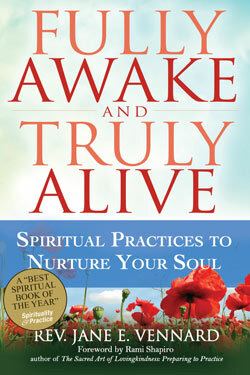 They want to awaken to the possibility of living authentic and purposeful lives. In other words, they want to become fully awake and truly alive. As a Christian, how did you become so inclusive of other faith traditions? I was brought up in the Christian tradition. The church my family attended was very intellectual and focused on mission. I loved church activities and the community; however, I did not receive a spiritual foundation. I drifted away from the church in my twenties, and felt no loss until a difficult divorce in my early thirties. I recognized my need for community and for connecting to something beyond myself. But I didn’t want to go back to church. I thought it would not offer me what I needed. So I began to explore other paths to renewal. I turned to nature, hiking and walking in a variety of places. I studied depth psychology and found meaning and guidance in my dreams. I paid attention to the needs of my body and began dancing, drumming, and doing tai chi and yoga. I practiced Buddhist meditation. I didn’t think of these activities as spiritual practice; they were simply things that quieted my soul. When I realized I needed to explore my Christian heritage, I still didn’t want to go to church, so I went to seminary. I come from an academic family so it made sense to me to study something before I joined it. In seminary I realized that the church had changed since my childhood and that the journey I had been on was a spiritual one. As I studied the Bible, church history, and Christian practices I came to see that at heart I was a Christian�not embracing all the beliefs, but rather recognizing that at the center of my journey was the desire to be a follower of Jesus. And to become that follower I did not have to give up my meditation practice, my earth- and body-based practices, or my understanding of and experience with transpersonal psychology. So rather than beginning with my Christian faith and opening to other traditions and practices, I brought many gifts from other faiths with me when I returned to the church. What are your own spiritual practices? Right now my basic practices are walking and reading. I try to walk every day, often alone or with my husband. I begin my mornings reading and sometimes journaling. I see my spiritual director almost every month and take at least one solitary silent retreat each year. I am a member of an InterPlay community that meets monthly where we dance and play together. When I am in Denver I attend worship at my local church. Recently I have been coloring mandalas and find that the body involvement helps to keep me mindful. I also experience my ministry of spiritual direction to be a spiritual practice. When I sit with another person, and together we listen and watch for the movement of the spirit, I am attuned to the Holy. When have you experienced the spaciousness that comes from inner quiet? What have you been learning? Have you experienced the shadow side of silence? Have you been silenced by another? Has silence ever been used as a weapon against you? What were some of your childhood experiences of being alone? What situations cause you to feel lonely? Have you experienced the difference between comfortable solitude and loneliness? When have you had the experience of non-attachment? of letting go and being engaged at the same time? What is your rhythm of contemplative, communal, and missional spiritual practices? What communal activities are you involved in that nurture your soul and renew your spirit? What has been your experience of offering hospitality to another? What was a blessing? What was difficult? What did you learn? Is there in inner stranger knocking on the door of your heart? What inner stranger might need to be welcomed into your own life? How do you practice service? In small ways or in large projects? Do you ever feel that you are not doing enough to ease the hurts of the world? How do you deal with these feelings? How do you express your gratitude to others and to God? Who in your life is a model of humility? When have you been compassionate with yourself? How has it affected your compassion toward others?